What does Rogate B1kepark have to offer? The Sandy slopes of Combe Hill that provide the setting for Rogate Downhill have been a favourite spot for mountain bikers since the dawn of the sport. As the years rolled by the site developed, reflecting the sport’s development. Traditionally a tale of two halves the upper site offers steep and techy trial with the lower site and its lessor gradient offering up jumps and drops galore. Since being adopted by B1KE the balance has been addressed and already we have added top to bottom flow lines as well as a wealth of techy options lower down the site. Filling in the holes in the progression pathway means the site now offers options for a far wider range of rider abilities. 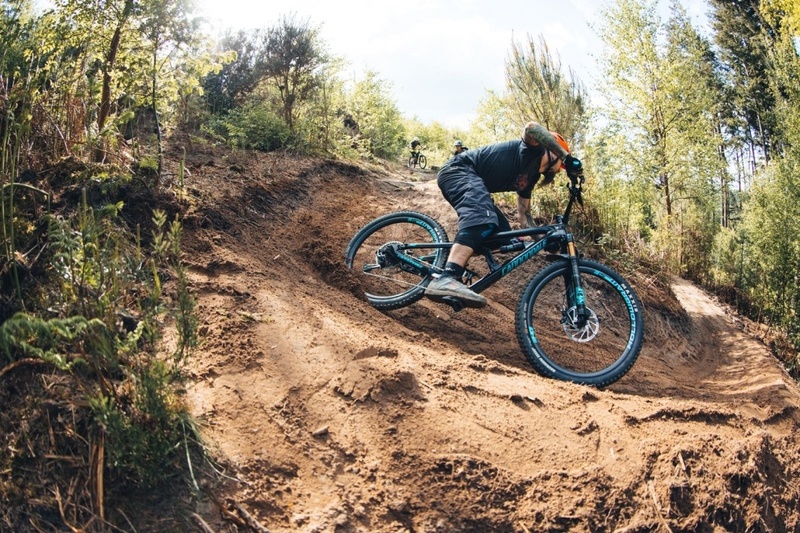 The new installations and reworking of old favourites has created a site that offers terrain to suit all and actively encourages rider progression. How much does it cost to ride at Rogate Downhill B1KEPARK? To Ride at Rogate Downhill you need to be a B1KEPARK Member, There are now 3 Membership Options. You can Register as a Free-2-Ride Member which is Free you will Pay for a £7 Day Pass on each visit. The second option is to Register as a Site Member which is a one off Fee to ride the site for 12 Months (the equivalent of 12.5 visits). Rogate Downhill is the perfect venue for progressing your Mountain Bike Skills. With a fantastic range of Trail Features that progress from small and rollable through to large. There really is something here for everyone regardless of age and experience. 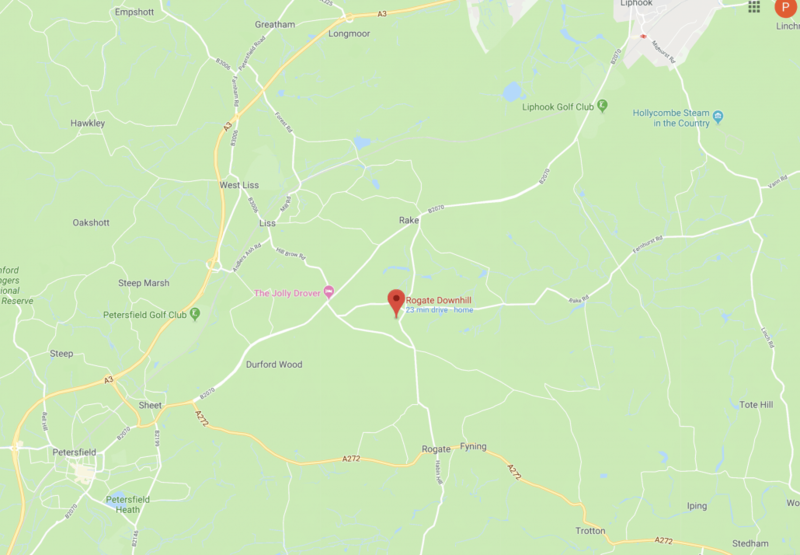 What does Rogate Downhill B1kepark have to offer? An amazing variety of trails are packed into a relatively small area. Whether its steep technical downhills or fast and flowing Jump lines, Rogate DH has them all. 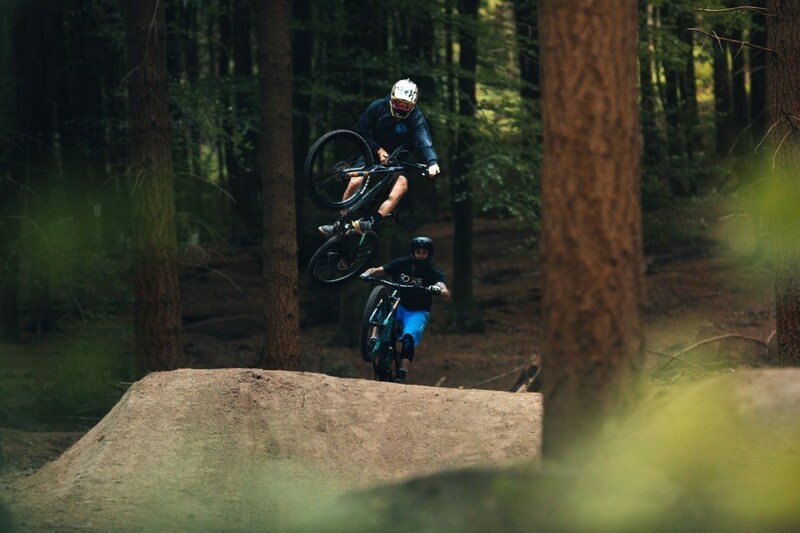 Rogate Downhill is where local riders cut their teeth and took their first steps to becoming elite level riders performing at the highest level on the world stage….and they still call the place home and enjoy the trails on a regular basis. Probably the most weather proof venue in the UK the site runs well all year but excels when others have turned to gloop. Rogate DH might be a small hill but it punches well above it’s weight. With loads more ideas in the pipeline, the future of Rogate Dh is very bright indeed and the sandy soil means that even if the skies are grey and the weather subprime the trails run well. Tended to by a full time team driven by a desire to constantly improve the rider experience, Rogate DH should be on every riders bucket list. Rogate Downhill has been attracting riders to its sandy slopes for over two decades. For many years a winter haunt for dedicated downhillers the park it’s rapidly building a reputation year round venue and attracts riders from all disciplines and of al abilities. Whether you are a fan of steep and gnarly, buttery smooth boosters or like to mix things up with a bit of everything RogateDH is a must ride location that works when all others are wetter than the proverbial Otter’s pocket. Fast, flowy and as rowdy as you want it to be. As easy or hard as you make it. A new line from the top of the hill is a great way to warm up and a great addition in providing the less experienced rider with a safe starting point and more experienced riders a fun flowing warm up. A new hand carved top section that includes a bit of everything, Roots, rocks, jumps and lines all over the place. Get creative and be rewarded. Loose. Goose-like! Get acquainted with rolling rocks and off-cambers. Steep chutes and deliciously sandy turns. A helping of rock adds to the flavour. Steep, narrow and testing. The flow is there if you can find it! The Clue is in the name…a trail original conceived by Sam & Mike. Gaps, Step downs, Camber and steeps….coming soon and a mind blower for the that like to merge the best of mother nature with hand crafted hits. Below the fire road the frequency of hits, ramps up and whether you’re new to riding and want to roll them, or experienced and like to enter Full send mode, these trails will make you grin. Hang a left at the end and you can reach for the stars or straight on and hit a line of small tables perfect for getting used to air beneath your wheels….either way you’ll head straight back up for another run. A true favourite and a line that has been redefined more often than wheel sizes. Drops, jumps, rough and smooth. Fast! A little bit of everything really and a trail that used to define Rogate. Options galore and and smiles all the way down. Tables, Drops, on-offs and gaps…what’s not to like. – flat-out fast with some big ol’ hits if you want them. Go on, scare yourself! 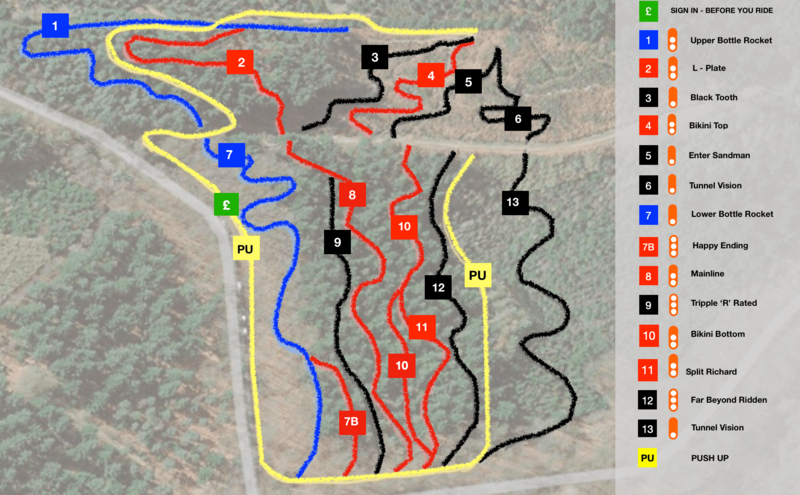 Pealing off Split Richard, Bikini Bottom is fast with an open-ended step-down into some killer berms and tabletops. Classic, natural turns, littered with roots and railing on marbles. Leads into the revamped 6-pack for those that like to boost as well as roost. Bring shades of ‘Shore to the hill. Linking with S & M on the upper Hill, this trail will add something that’s been missing from the UK scene for way too long…its a wait and see for now but we’ll have this ready before the Summer is out. So pleased to be able to call this place home. After a gruelling schedule of World Cups this place is an Oasis of fun. Never get bored of the lines and love the variety of trails on offer.